2010 June «Suad Bejtovic Photography etc. Suad Bejtovic Photography etc. And, yet, this doesn’t look instantly recognizable as Half Dome. 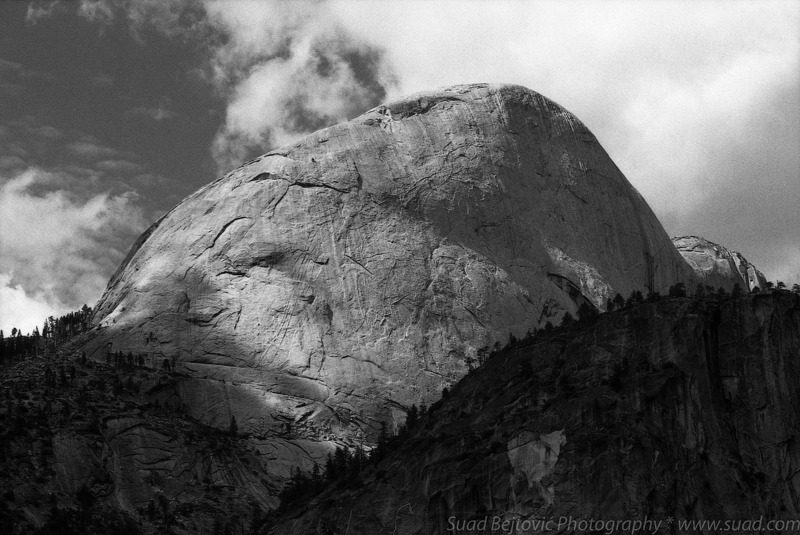 For the third love letter to Half Dome created by my 85mm f/1.8 USM lens, I picked this image, shot on Ilford FP4+ film using an orange filter to increase the contrast between the sky and the clouds. 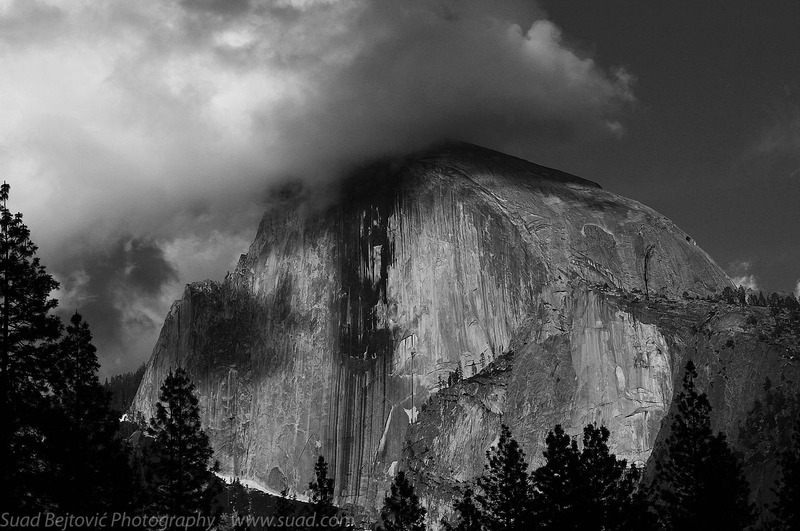 It is the back side of Half Dome, the side that makes it seem like there was a Full Dome once. This was taken slightly above Nevada Fall, on the John Muir trail. Scott, John, Tyler and I have been climbing up Mist Trail all day and got thoroughly soaked three times – at Vernal Fall, Nevada Fall, and then again, a few yards from where this was taken, where some random snow melt endlessly dripped over the narrow trail as a never-ending cold shower. We were tired and wet, but once we got to this side of the Nevada Fall, we realized what we were looking up at. 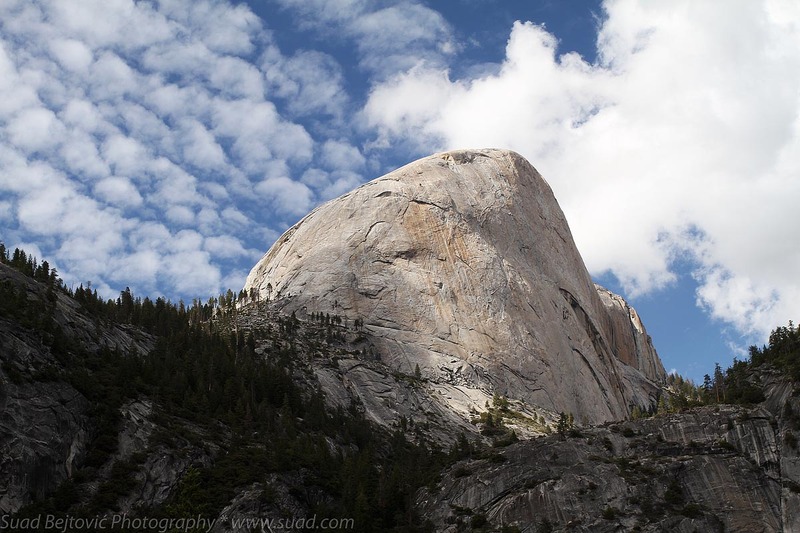 The sheer, smooth cliff above was none other than our friend Half Dome, in a rarely seen angle. And while the fascination with its face and profile has been long documented in countless photos by masters and laymen alike, it was a surprise to see the smoothness of the dome, interrupted only by a few scars, carved by Father Time and Mother Nature. As it were, I don’t have many shots from this vantage point. Day was getting long and legs weary. Some others have more interesting skies or a different composition; one of those, a digital effort, is shown here for purposes of comparison. But in the end, I chose this shot because I thought the sparse splashes of color distract from the beauty of the subject. A subject, that, quite accidentally, captured the heart of my favorite lens. As I mentioned before, on our trip through Yosemite National Park, Scott, John, Tyler and I unwittingly made Half Dome the main subject of many of our photos. 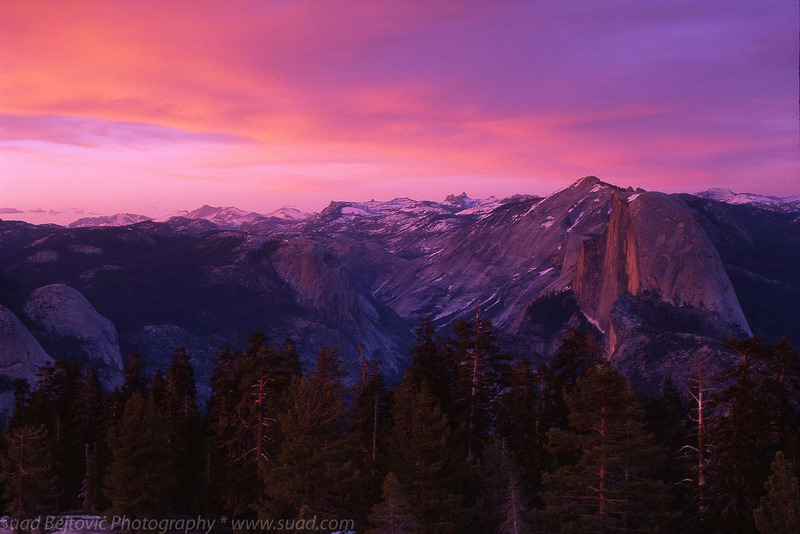 The peak towers over all of the Yosemite Valley, and you can see it from just about anywhere. Ironically, the only higher peak is called Clouds Rest. This particular afternoon, we were stuck in the horrible traffic of the Valley, trying to get some supplies for the evening and the day ahead. We exerted ourselves on the Mist Trail (photos from which are coming very soon), and we hoped to take in the sunset at the Tunnel View. But, as we crossed the bridge over Merced river on the eastern end of the valley, we saw a big cloud covering the top of Half Dome in a striking scene. We quickly found a parking spot (no small feat! ), and dragged our tired legs out of the car. The brightly lit Half Dome was reflecting in the river, but the late afternoon sun was leaving a lot of shadow and it was difficult to find the correct exposure. The only possible shot was with a telephoto lens, and I mounted my 85mm f/1.8 USM lens on the Canon 7D and fired off a few shots. It wasn’t the golden hour yet, so the colors aren’t spectacular. I even thought about converting to black and white, which I’ve done below. But, I think just the sight of the threatening cloud obscuring the peak looks quite dramatic, and the pine tree silhouettes complete the framing very nicely. Although it was well into June, Yosemite still had enormous reserves of snow. So much so, in fact, that the Tioga Pass road, connecting the Valley with the east end of the park, was open literally two days before we drove across it to Lee Vining. The drive was incredibly picturesque, and since we were headed east, the afternoon sun was behind us and the Dana Fork went the other way along the road. Dana Fork is usually a mountain creek feeding the Tenaya Lake, but after copious amounts of snow and the first long string of warm, sunny days, it was a raging river barreling down the mountain, flooding meadows and jumping over boulders and tree trunks. On two separate occasions that evening, as well as the following morning, Scott, John, Tyler and I made a quick stop to explore the rapids for some photographic opportunities. The other three made good use of their neutral density filters, which block out a lot of light coming into the camera, allowing long exposure times, which in turn yield milky smooth water effect. Since I wasn’t a card-carrying member of the ND club, I focused on only moderately long exposures, in the range of 1/30th of a second. That’s still long enough to show some water flow, but short enough that camera shake isn’t an issue, especially with a 17-40mm f/4L lens. This scene was the one I particularly liked, with a nice separation of the clouds from the sky and plenty of nice looking pine trees. A narrow aperture brought out the natural sharpness of the FP4 film, so I didn’t bother with any post-production manipulation. 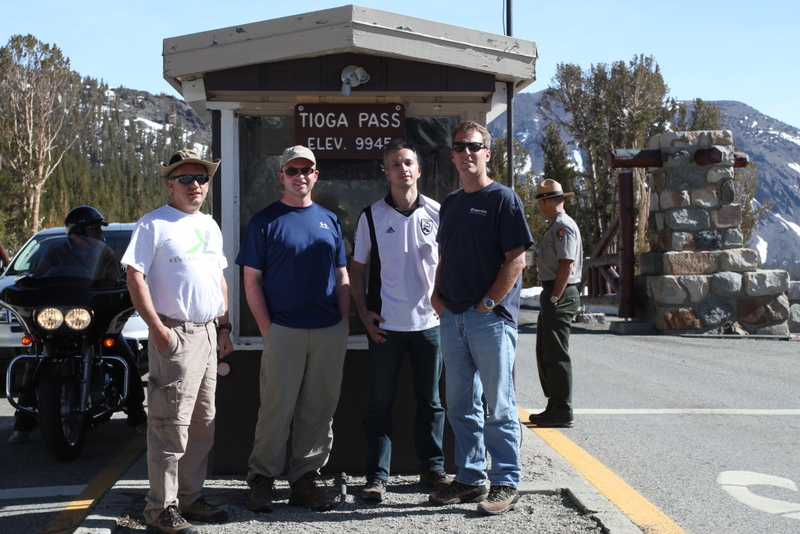 As a blog special, here’s a photo of all four of us on the eastern entrance to Yosemite, which is the highest point on the Tioga Pass Road. It marks the first time I’ve been at more than 3000 meters elevation. In our quests to enjoy the American landscapes, my friends Scott, John, Tyler and I went through some really weird places. 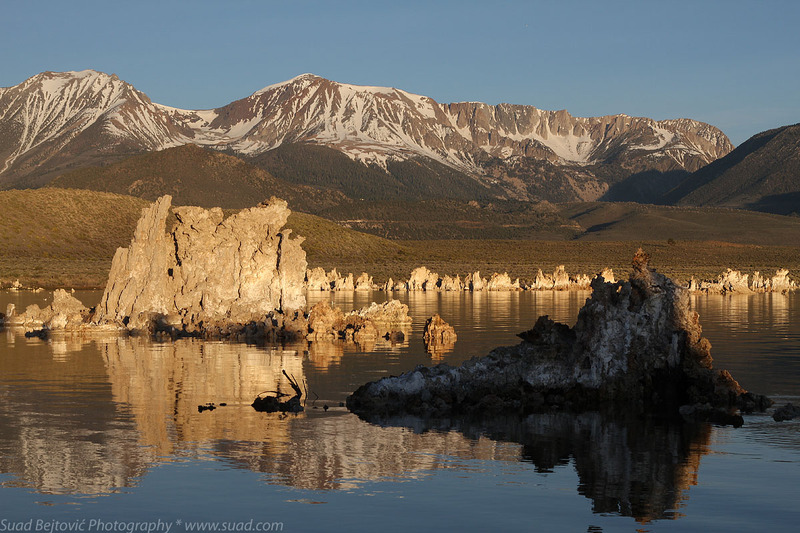 Up there on the weird scale is this new entry, Mono Lake, to the east of Yosemite National Park. The lake is a freak of nature; it’s salty and alkaline, and its geology is quite unusual. It is in the middle of nowhere, with only a small town of Lee Vining nearby. The limestone formations you see in the foreground are called “tufa”, and they are calcium deposits created from hot springs bubbling from under the lake. They can appear quite eerie in golden hour light, so we picked the lake for our first sunrise location on the trip. I didn’t really know what to expect, so I was taken by surprise with the alien landscape. I shot mainly with my 7D, looking for a way to start off a brand new roll of 120 size Fuji Velvia film. And while I got some interesting colors on the digital camera, Velvia knocked it out of the park when I scanned the shot above. The sky and the water are almost an unnatural purple, but I like how the mountains in the background stand out and layer the image along with the tufas. On a technical note, my horizon wasn’t level, so I rotated the original 4:3 image and cropped it to 3:2. 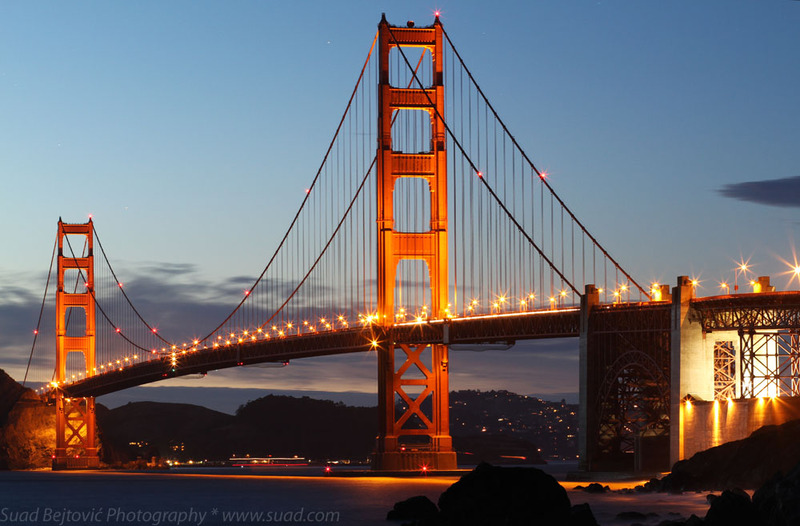 Below is a similar digital shot – both are otherwise untouched.